Here you will learn what are the different colors the ink cartridges are made of. Ink cartridges are made of different four base colors which are cyan, magenta, yellow and black, in reality, just the yellow and the black are substantive models synthesis colors; cyan and magenta are subtractive colors. 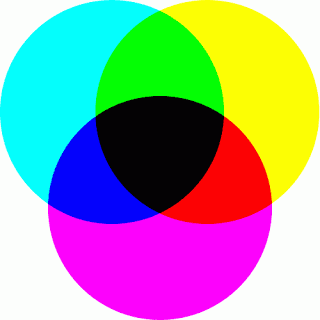 This is a kind of combination that is named as CMYK, this combination stands for Cyan, Magenta, Yellow, and Key. As seen in the image below, a combination of two colors can create different colors. For example, Yellow and Bleu will give you green, yellow and pink will give you red (...). Refilling the ink cartridges using the pigment ink gives the printer higher print quality because the pigmented is water-based ink. This type of ink is usually used for the colors ink cartridges, for example, HP ink cartridges. You can usually get the ink water-based on any computer shop or store to refill the cartridges, the pigment ink can be a little more expensive than ink water-based. It is recommended to use the pigmented ink only for printers with head, using the water-based ink can damage the heads of the Designjet printers. However, for an inkjet printer, you can use any kind of ink but the water-based ink is more advisable. Do not be fooled by buying an extremely expensive ink thinking that this may help your printer to print better, for example, printers with continuous ink systems, sometimes recommended using ink DYE PREMIUM which is the same as water-based ink and is not actually premium ink.